Ex-CIA agent Steve Dane and his lady love, ex-FSB (formerly KGB) agent Nina Talikova, enjoy each other’s company immensely, but aren’t really happy unless bullets are flying and things are blowing up around them. That’s where author Brian Drake comes in—sending them hither and yon around the globe, and keeping them up to their necks in action. In each leg of their mission, Dane and Nina are aided by—or go up against—old friends from their many years in the spy biz. The trail starts in Italy. What begins as a job to rescue the kidnapped daughter of a Mafia boss evolves into a race to recover a stolen SADM (otherwise known as a suitcase nuke). Then it’s off to Paris, where the main fly in the ointment is Dane’s former protégé, IRA alumnus Sean McFadden, who does his level best to kill them. After a side-trip to Greece, it’s off to Mexico, where a particularly vicious cartel—employing more weapons purchased from the Duchess—are terrorizing a big chunk of the country. The trail leads next to New York, where Dane and Nina run a scam on Nina’s Russian FSB mentor and foil a plot to embarrass Dane's old pal the President, then bop over to Helsinki for the final battle with McFadden and the Duchess. Busy bees, these. In between all the firefights, car chases and explosions, there’s plenty of entertaining sexual (and non-sexual) banter between Dane and Nina, a good deal of local color from each exotic locale, and a lot of attention to various sorts of exotic weapons. Adding to the festivities are song lyrics in the dialogue, thinly veiled references to that other super secret agent (you know, the British guy), and a nod to Raymond Chandler. 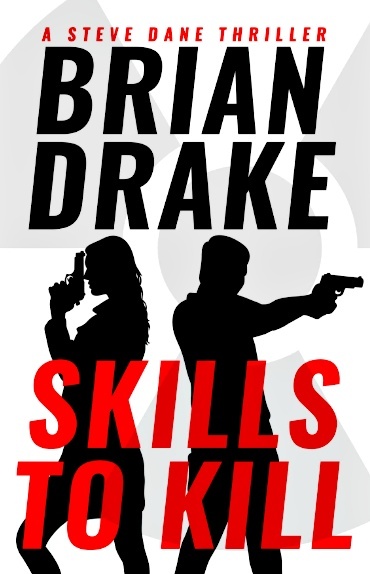 But despite all the focus on action, Skills to Kill’s strongest point is the relationship between Dane and Nina. They are genuinely likeable characters, and when they’re having fun (which is most of the time) you will too.